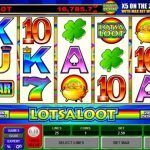 Lots of gold coins and Irish luck is all what LotsALoot 5 Reel from Microgaming is about. This is a 5 reel slot that can be fun to play especially since it offers a progressive jackpot. The amount that this slot offers is not life changing like in other progressive Microgaming’s slots but it is still worth it. The design of the game is quite basic as you can see. The symbols are huge and they take up most of the space on the reels and for that reason there is no background like in other games. 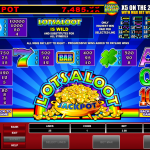 LotsALoot 5 Reel attracts players for its progressive jackpot. There are no special features in this game or special symbols for that matter. We only have one wild which is the logo of the game. Its primary function is to substitute for every other symbol in this game. There are no scatter symbols here so the wild can literally stand in for every symbol to complete a winning line. What you want to see while you play LotsALoot 5 Reel are 5 wilds on the 25th pay line. This is actually the only way you can win the jackpot. This is something that does not happen very often but when it does it is amazing. Seeing all those numbers above the reels added to your balance is priceless. Microgaming created LotsALoot 5 Reel as a sequel to LotsALoot 3 Reel, having in mind every kind of players. You can choose whichever game you like and hope for the best. They are both basic slots with simple game play and similar outcome. If you have not got the chance to play this game before we would advise you to do it. 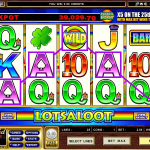 For the previous version of this slot you should consider playing LotsALoot 3 Reel a 3 reel slot by MicroGaming.